For all of us out there traveling is kinda part of our lives. We travel frequently for various different purposes like business trips or a tour with family and friends. But what’s common between both of them is the luggage you carry. Your clothes, footwear, underwear and some daily needs are always with you on your tour; no matter you are traveling for a week or two. And I’m damn sure you are looking for the best suitcase for you travel, voila my friend you are at the right place. 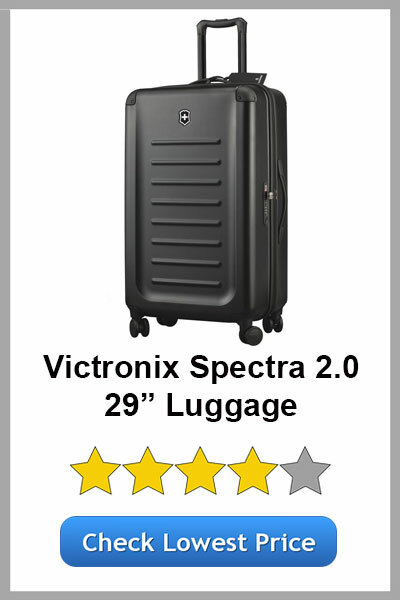 We have got one of the best luggage for you and here’s the full in-depth review of Victorinox Spectra 2.0 29’’ Check-in Luggage Bag with all pros and cons. 2 All Benefits You Can Enjoy! Victorinox is a well-known brand for making excellent backpacks and suitcases worldwide. The Spectra 2.0 is a very decent bag with some great features and functionality like matte finish case, dual caster wheels, multipurpose pockets (both inside and outside), zipper bumpers, and corner cards to keep your suitcase look one of the best among all. Victorinox Spectra 29’’ is a sturdy and suitcase built with keeping in mind a traveler who loves to visit different places and have fun. It has a durable exterior design with convenient space for all your accessories from holding a laptop straight or keeping a water bottle separately. The one I had with me is of black color, although others also look good when I bought it the only available option was of black color. I have seen real-life pictures of all other bags, all of them look incredible. Square design makes it more comfortable that makes it much easier to pull at the surface of railway station or airport. The square shape also increases the capacity, not much but a little that really makes it better. Now before we move let’s have a look at its specifications and general features. It is made of 100% Bayer polycarbonate. It consists of 8 dual-caster wheels that help you to pull the bag easily. The exact dimensions of the bag are 7.9 x 15 x 21.7 inches (L x B x H) and do you know that maximum height allowed for most of the airlines is 22 inches. The volume of the bag is 70 liters.This bag weighs around 7.1 pounds when is empty and is neither heavy nor very light when is filled with your accessories. It has a stylish scratch-resistant matte finish on the case. The zippered mesh divider wall stretches for easy packing. The straps are compressed and Y-shaped. with all comfortable heights according to your height. The bag has the water-resistant technology. This bag comes with a 10 year worldwide limited warranty. The lock provided is the TSA lock. All Benefits You Can Enjoy! The Victorinox Spectra 2.0 has 8 dual-caster wheels that help you to pull the bag with ease. So technically there are 8 wheels of which 2 are attached to each corner. I had tested too many bags and suitcases, but I would say that the spinner wheels on this one are one of the best qualities that you can get in the market at this price. I haven’t used such smooth and sturdy wheels before. But, one thing that would irritate you is the sound they create while being pulled. The wheels are loud when you roll them over bumpy surfaces or sidewalks. While I was at the airport they were almost soundless on the way around but at sidewalks and bumpy surfaces they start to rattle and create some irritating sound, so you can consider this as a drawback of this bag. Just like other suitcases the Victorinox Spectra 2.0 is also made up of Bayer polycarbonate. That’s not to say that it has quality like other hard-case suitcases. If you see it from a distance it looks like made up of aluminum. 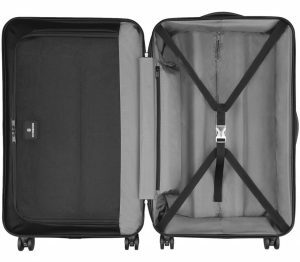 When you will come to the exterior of the suitcase, you will find that it is more rigid and less flexible than other hard case suitcases available in the market. The outer surface of the bag can get scratches and scuffed, but that does not make it a bad choice at all. The interior of the Victorinox Spectra 2.0 is well built and furnished. There are basically two main compartments. But in case you don’t need the other one with zippers ad sub-compartments then you can easily unzip that one and use the suitcase with a single compartment. It has Velcro patches that hold the rolling panel at the same place. As you will open the quick access door you will interact with the second compartment where you can put your laptop and other things. This padded compartment can be removed with ease and you can make a single big compartment to have more space. You can completely remove it when not in use. There are various items that you can put in this quick access compartment instead of removing it. Like you can easily put your Laptop along with water bottle, ID cards and other documentation or lunch box at the side. It has number patterned lock that can be easily broken, so it can’t be called completely safe. Also, the second/quick access compartment does not have any zipper security or something, so your laptop or whatever you keep there won’t be safe. I don’t have any personal issues with the bag, however just wonder about its unusual design. Although it has its own benefits still it would be a little odd for you to be habitual of the bag. For me and even, it would be for you as well about the quick access compartment. As you can see it opens horizontally and not vertically so it does not make much sense. Although it won’t let your accessories fall out still it is easier to take out the laptop if the compartment opens vertically. Not only this, it would also not let others know what exactly you have inside your bag. One more thing that let me think about is the handle to pick the bag and keep it somewhere. It has only one handle at the top and nothing at sides or bottom. So in case you want to put it in the luggage compartment of the airplane, it would be difficult to do so as you will have only one handle to pick it and keep inside the compartment. Instead, it should have at least two handles to move it and place it somewhere with ease. Victorinox has been successful in making a good looking plus a highly functional backpack. This Victorinox Spectra 2.0 Luggage is easy to handle and would make your travel experience more fun and interesting with its quick access compartment. This might not be the lightest or the cheapest one that you can get but it is surely the one that will make your travel experience better. In all this one is the value for money product so you should surely check it once on Amazon from here. Do let us know in the comment section below how your experience was and what we can add to our Spectra 2.0 Review and how the bag made you satisfied with its amazing features and functionality.